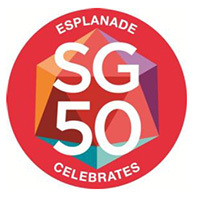 Esplanade – Theatres on the Bay invites everyone to celebrate Singapore‘s 50th year of nation building (SG50) with a meaningful line-up of special commissions and collaborations all through the year, involving a wide range of Singapore artists across art forms and generations. Our nation‘s arts and culture are what defines who we are as a people—they reflect our traditions and beliefs, challenge our fears and perspectives, and give voice to our hopes and dreams. As the national arts centre, Esplanade commemorates Singapore‘s 50th birthday by placing at the fore our Singapore artists and inviting the communities we serve to connect with and be inspired anew by the stories, songs, dance, art, people and values that we hold dear. 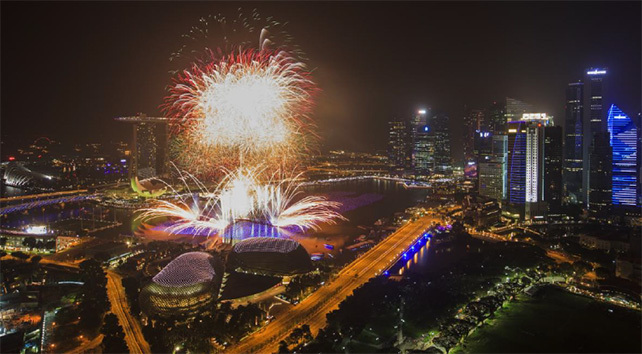 Singapore‘s SG50 celebrations will kick off with the Marina Bay Singapore Countdown (MBSC) 2015 and wrap with MBSC 2016, the city‘s iconic New Year‘s Eve countdown event jointly presented by Esplanade and the Urban Redevelopment Authority. This highly anticipated fireworks display will be specially choreographed to a score composed by two up-and-coming Singapore music talents, Julian Wong and Riduan Zalani, who received guidance from the late musician Iskandar Ismail. For all Esplanade‘s visitors, the visual arts presentations at the centre‘s Concourse, the Esplanade Tunnel, Jendela – A Visual Arts Space and other public spaces are often their first encounter with the arts at the centre. As part of SG50, Esplanade invites all visitors to be present, to be here and stand before an artwork that engages the mind and spirit. In the same way, Singapore artists are invited to explore three themes that reflect a nation‘s DNA—Things (The Body), Places (The Soul) and People (The Spirit). As the year begins, the artists who have worked with Esplanade since its opening will return to participate in the exhibition These Sacred Things. Throughout 2015, the line-up of artists includes Chua Chye Teck, Han Sai Por and Koh Nguang How; young illustrators Mary Bernadette Lee and Wong Wei Loong; as well as photographers Darren Soh, Caleb Ming and the twentyfifteen.sg initiative. Visitors can also find out more about the centre‘s history, usage and place in the development of the arts in Singapore at the revamped Passages – The Esplanade Story and the accompanying Tribute.sg exhibition at the Upper Concourse. Through theatre, Esplanade invites Singaporeans to reflect on the characters who have walked through the nation‘s history on stage, and to experience the stories that they will hold dear into the future. In addition to exploring new Malay, Chinese and Tamil theatre productions, Esplanade will also be presenting a special SG50 season of The Studios – an Esplanade series that has been developing, producing and presenting local theatre productions. The Studios: fifty celebrates 50 works of Singapore‘s English-language theatre starting from the 1960s. Co-curated by Chong Tze Chien and Esplanade, the 2015 season will commission five plays as full productions and present 45 plays in the form of dramatised readings. These works are re-interpreted by a range of local directors such as Aidli ‘Alin’ Mosbit, Tracie Pang, Oliver Chong, Jeff Chen and Zizi Azah. Especially for young audiences, Esplanade‘s line-up for Feed Your Imagination (F.Y.I) will present theatre and music productions that give students a peek at Singapore‘s history. These include Samsui Women: One Brick at a Time, a story set in the 1960s and based on the lives of Samsui women by Singapore theatre company The Finger Players; A Legend Begins, a music presentation in collaboration with Ding Yi Music Company which tells the story of Sang Nila Utama; Our Songs, Our Stories which reflects the lives and hopes of everyday Singaporeans through xinyao; and more.